Q-Connect Multipurpose Labels 139x99mm 4 Per Sheet White (Pack of 400) 9670055 Pack of 1 Q-Connect multi-purpose Labels. Bright White self adhesive labels suitable for all types of printers. Label Size 139mmx99mm. 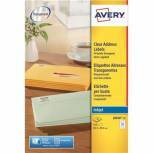 Avery Inkjet Address Labels QuickDRY 99.1x38.1mm 14 Per Sheet White (Pack of 1400) J8163-100 Pack of 1 99.1x38.1mm. 14 labels per sheet. 100 sheets per pack. 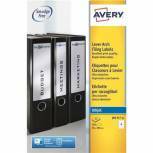 Avery Lever Arch Filing Labels Inkjet 200mm x 60mm (Pack of 100) J8171-25 Pack of 1 White labels are specifically designed for Black and White or colour inkjet printing. Designed to fit lever arch spine they are ideal for organised and professional filing. Easy to format using existing software, 25 sheets per pack. (Laser labels shown). 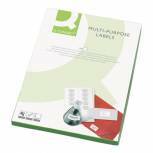 Q-Connect Multipurpose Labels 99.1x42.3mm 12 Per Sheet White (Pack of 1200) 9670017 Pack of 1 Q-Connect multi-purpose Labels. Bright White self adhesive labels suitable for all types of printers. Label Size: 99.1mmx42.3mm. Q-Connect Multipurpose Labels 99.1x93.1mm 6 Per Sheet White (Pack of 600) 9670054 Pack of 1 Q-Connect multi-purpose Labels. Bright White self adhesive labels suitable for all types of printers. Label Size 99.1mmx93.1mm. Seiko Shipping Label 54x101mm White (Pack of 220) SLP-SRL Pack of 1 Seiko Shipping Labels. Large white labels for large envelopes, packages, cartons, name badges, bar codes etc. Size: 54 x 101mm. Colour: White. OEM: SLP-SRL. 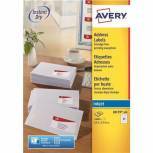 Avery Inkjet Address Labels QuickDRY 99.1x33.9mm 16 Per Sheet White (Pack of 1600) J8162-100 Pack of 1 99.1x33.9mm. 16 labels per sheet. 100 sheets per pack. 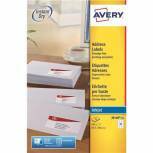 Avery Inkjet Address Labels QuickDRY 63.5x38.1mm 21 Per Sheet White (Pack of 525) J8160-25 Pack of 1 Avery Inkjet Labels - J8160-25. Address labels specially for inkjet printers. Manufactured from new Quick Dry material for a smudge free performance. Permanent Adhesive. Label Size 63.5x38.1mm. 21 per sheet. 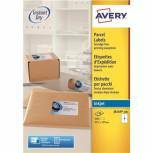 Avery Inkjet Parcel Labels QuickDRY 139 x 99.1mm 4 Per Sheet White (Pack of 100) J8169-25 Pack of 1 Avery Inkjet Labels - J8169-25. Parcel labels specially for inkjet printers. Manufactured from new Quick Dry material for a smudge free performance. Permanent Adhesive. Label Size 139.1x99.1mm. 4 per sheet. 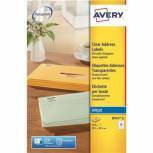 Avery Inkjet Address Labels QuickDRY 63.5x33.9mm 24 Per Sheet White (Pack of 2400) J8159-100 Pack of 1 63.5 x 33.9mm. 24 labels per sheet. 100 sheets per pack. 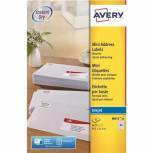 Avery Inkjet Address Labels QuickDRY 99.1x57mm 10 Per Sheet White (Pack of 1000) J8173-100 Pack of 1 Avery Inkjet Labels. Size 99.1x57mm. 10 labels per sheet. 100 sheets per box. White. Avery Inkjet Parcel Labels QuickDRY 139 x 99.1mm 4 Per Sheet White (Pack of 400) J8169-100 Pack of 1 Avery Inkjet Labels - J8169. 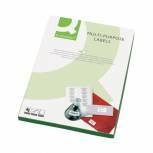 Parcel labels specially for inkjet printers. Manufactured from new Quick Dry material for a smudge free performance. Permanent Adhesive. Label Size 139.1x99.1mm. 4 per sheet. 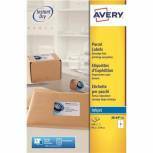 Avery Inkjet Parcel Labels QuickDRY 199.6 x 143.5mm 2 Per Sheet White (Pack of 50) J8168-25 Pack of 1 Avery Inkjet Labels - J8168-25. Parcel labels specially for inkjet printers. Manufactured from new Quick Dry material for a smudge free performance. Permanent Adhesive. 199.6x143.5mm. 2 per sheet. 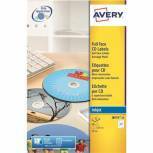 Avery Inkjet Labels 63.5x38.1mm 21 Per Sheet Clear (Pack of 525) J8560-25 Pack of 1 Avery Inkjet Labels - J8560-25. Clear inkjet labels that virtually disappear when applied to White, coloured or textured surfaces giving an individually typed look. Label Size: 63.5 x 38.1mm (21-label per sheet). Avery Mini White Inkjet Label 38.1 x 21.2mm 65 Per Sheet (Pack of 1625) J8651-25 Pack of 1 Avery Inkjet Mini Label. Ideal for small item labelling. Easy to format using popular software packages. Suitable for use in most inkjet printers. Label Size 38.1x21.2mm. 65 per sheet. White. Avery Full Face Inkjet White CD Labels 2 Per Sheet (Pack of 50) J8676-25 Pack of 1 Full Face CD Labels specifically designed to run through an inkjet printer. The 117mm full face holographic design gives more space to add graphics and other personal touches. 2 labels per sheet. Avery Inkjet Labels 99x38mm 14 Per Sheet Clear (Pack of 350) J8563-25 Pack of 1 Avery Inkjet Labels - J8563-25. Clear inkjet labels that virtually disappear when applied to White, coloured or textured surfaces giving an individually typed look. Label Size: 99.1 x 38.1mm (14-labels per sheet). Avery Inkjet Parcel Labels QuickDRY 99.1 x 67.7mm 8 Per Sheet White (Pack of 800) J8165-100 Pack of 1 99.1mmx67.7mm 8 labels per sheet. 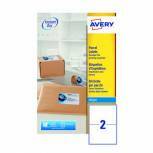 Avery Inkjet Parcel Label QuickDRY 199.6 x 289.1mm 1 Per Sheet White (Pack of 100) J8167-100 Pack of 1 199.6mmx289.1 1 label per sheet. 100 sheets per pack. Avery Inkjet Parcel Label QuickDRY 199.6 x 143.5mm 2 Per Sheet White (Pack of 200) J8168-100 Pack of 1 Avery Inkjet Labels - J8168. Parcel labels specially for inkjet printers. Manufactured from new Quick Dry material for a smudge free performance. Permanent Adhesive. 199.6x143.5mm. 2 per sheet.